I think it is safe to that Scott Snyder is one twisted individual. Brilliant. Gifted. But, boy, can he do some sick things in a Batman book. It seems that almost every month brings another perfect or near perfect Batman book. This month is no exception. Issue number sixteen is the penultimate issue in the much-revered Death of the Family story arc, and boy is it a doozy. We have finally reached the point in the story where all the pieces have been put in place and the tension is ratcheted to almost unbearable levels. I sat down and read this issue immediately when I got it Wednesday afternoon, and it stuck with me through all the rest of the comics I read that day. Each issue after would only make me think about how dark FCO made Arkham look or how subtle Capullo’s detail work was. Less than stellar dialogue in other books made me long to be reading Snyder’s natural character interactions. The fact is, Batman this week ruined almost everything else that came out along side it. This is a Batman issue for the ages. It is creepy, it is disturbing, and it is an absolutely perfect example of how to pace a modern superhero story. There are theatrical moments, there are quiet moments, and throughout the entire issue, the story builds in tension and atmosphere. By the time we reach the final destination alongside Batman, it is impossible not to be on the edge of your seat waiting for the other shoe to drop. Snyder and co. utilize the comic book format better than almost anyone else in the game. Whether it is how they depict action flowing from panel to panel or that suspenseful moment they set up when you turn from one page to the next, these guys just get it. This story could only work as a comic book. You need time to revel in the spreads of Batman villains and the physical experience of turning page after page to help build that tension. Snyder and Capullo get that and as I said before just make it work. I’m not going to waste anyone’s time here describing plot detail after plot detail. To be honest, that is not what makes issue sixteen such a joy to read. It’s the experience. It’s the fact that Capullo has drawn the Joker’s face to look a little bit more rotted and decomposed than when we first saw it so many issues ago. It’s the little flies you can follow from panel to panel whenever the joker is close. The fact that you can feel the little twists and turns of the stairs Batman climbs Arkham asylum. This issue works because you can just flip through the 22 pages of main story and get it. The pacing, the tension, the emotion, it is all there even without the dialogue and narration. So let me borrow a page from Ferris Bueller’s book: Why are you still here? The review is over, go home! Read Batman! I promise, you won’t regret it. I thought it was good, but not 10/10 good. To me, the whole "Batman's gotta fight his way through arkham to get to the Joker" thing was a mistake. 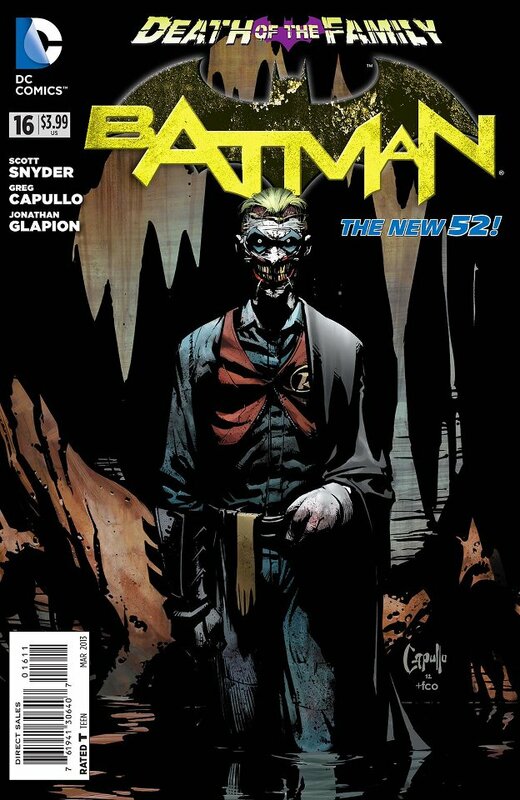 If this is the penultimate issue of the Joker storyline, it needs more Joker. Probably didn't help that I kept reading all the hype of how awesome it was gonna be either. It was definitely hyped up but I think it delivered. It was a pretty intense issue. Overall good pacing throughout and Cappulo's art was once again bang on. I am a little confused with the back-up story being really just a continuation of the main story why the switch in artist? I also was a bit surprised that Penguin, Two-Face, and Riddler acting as sort hired goons for the Joker. I guess they really just wanted to see Bats get killed.